Home » Plan your visit » Trip Advisor success! It’s official - Tamworth Castle is in the top 10% of attractions when it comes to pleasing our customers! Trip Advisor has awarded Tamworth Castle a prestigious ‘Certificate of Excellence’, which is awarded to businesses and visitor attractions which consistently earn high ratings from Trip Advisor users. We have won this award five years in a row now, 2014, 2015, 2016, 2017 and 2018! Take a look at reviews of Tamworth Castle on TripAdvisor - and we are ranked as the number one attraction in Tamworth! 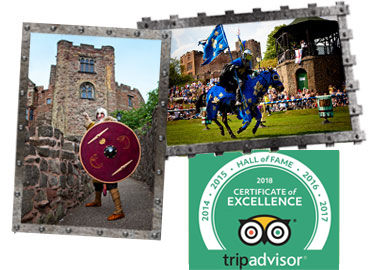 The awarding of the Certificate of Excellence puts Tamworth Castle in the top 10% of all businesses and attractions worldwide and allows the Castle to display the certificate on its website and all its branding. This is not the first time that Tamworth has made an impact on Trip Advisor. Previously Tamworth was ranked as the fourth fastest growing European destination on the site – thanks to the huge rise in searches prompted by the Staffordshire Hoard exhibition, the Saxon Festival, St George’s Day celebrations and the Ultrasound music festival.